If you’re serious about your health and fitness goals, then you should get one. These are the top five reasons why everyone has a fitness tracker and why Fitness Trackers are a Must-Have that you need one too. 1. Fitness trackers have pedometers beat and cowering in the corner. Pedometers are great. They track your steps and occasionally will tell you how many miles you walked. That’s it. That’s literally it. Fitness trackers are more than pedometers. They have a bunch of other jobs and they do them well. Depending on the kind of fitness tracker you get, they can do anything from track the calories you burned, track your heartbeat, tell you the time, track your sleeping patterns and even wake you up. They also come with an app that lets you track food and water intake. Most people think that fitness trackers are just pedometers, but they are actually an essential tool for a healthy lifestyle. 2. Lose weight and achieve goals. Because fitness trackers help you set daily goals and count your calories, they motivate you to get running. Some fitness trackers give you badges for achieving awesome goals like walking up ten flights of stairs in one day. Some even some with an app where you can challenge your friends and family to see who can take more steps. Your progress is then shared with your friends. Together, you can motivate each other to keep going. Some fitness trackers have other synchronizable products available for purchase. One of our favorite products for a healthy lifestyle is a synchronizable scale. These scales (if in the same line as your fitness tracker and if they offer this ability) will sync with your tracker, so that every time you weigh yourself, the scale will recognize who you are in your household by weight and catalog it into your app remotely. From there you can track your weight over the course of weeks and set goals to improve it. The more steps you take, the more calories you burn and the more weight you lose. With the motivating systems that fitness trackers offer, losing weight isn’t just easier but it’s actually kind of fun. Who doesn’t like a challenge? 3. Sleep tight and wake up refreshed. Nobody likes sleeping soundly in your warm and cozy nest when out of nowhere the alarm goes blaring. You sleepily rush to turn it off, but by then your grumpiness has set it. You’re definitely awake, but that alarm certainly didn’t start your day off right. Fitness trackers make your alarm clock obsolete. We briefly mentioned this feature above, but it’s so great that it deserves its own paragraph. With the unique app, most fitness trackers will be able to tell you when you fell asleep, when you were restless, when you woke up and when you slept deeply. In the morning, if you set an alarm and sync it to your fitness tracker, you’ll be woken up by the fitness tracker gently buzzing on your wrist. It’s a bit jarring when you’re not used to it, but it wakes you up slowly and without ruining your morning. If you look at the sleep tracker on your app, it will tell you how much you actually slept. It might surprise you that you only slept for seven hours when you thought you got eight and a half hours of rest. You might learn that you need to go to sleep earlier or get a more comfortable bed or pillows. 4. Pace yourself when training. Fitness trackers are incredible for everyone. They’re great for beginners and runners with years of experience. Not all fitness trackers have this incredible feature, so you might have to splurge a little, but having a heartrate tracker is a must for all runners. It doesn’t matter if you’re training yourself to run for the first time or if this is the third race you’re training for this year, examining your heartrate is key. Runners know how important is to train not only their legs, but also their hearts to be able to win a big race. If you’re running more than you’re used to, you’ll have to control how high your heart rate gets by breathing and breaking. If you give it time and use this awesome feature, you’ll learn how to get your heartrate to work with you. 5. Knowing your own strength is motivating. If you’ve never exercised a day in your life, fitness trackers are still powerful, so imagine what they can do for some who exercises every day. Just seeing your progress is enough to want to achieve more. Making progress tangible with numbers, graphs and badges, makes it look easier. It seems motivating when you have an achievable goal. Every time you complete your step goal, your fitness tracker will vibrate and let you know how awesome you did! It’s so motivating to complete more. When you see that you can complete your goal in a streak, it’s easy to increase your goal. You’ll be working toward ten thousand steps by walking to the store and taking the stairs in no time! Most fitness trackers suggest you walk 10,000 steps each day, but you can always set your own goals above and below that limit. No worries! 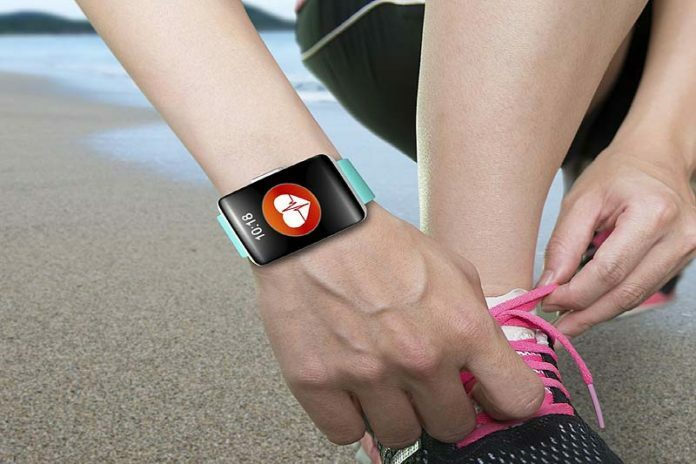 Fitness trackers are a new trend but they certainly aren’t a fad. They’re here to stay because they’re useful for anyone from the common couch potato to the regular weekend warrior and beyond. Whoever you are, fitness trackers will improve your life and set you on the path to becoming more productive, better rested and healthier. Wake up, sleeping beauty, and get your fitness tracker today!